Perhaps one of the most exciting reveals during yesterday's Nintendo Indie Highlights presentation was Image & Form's latest project, SteamWorld Quest. Taking the SteamWorld universe we already know and love, and steering it in a completely new card-based RPG direction, this one looks like it could be a real winner. Details yesterday were slightly vague in places - intentionally so this early on - but we now know a little bit more about the game. First up, the developer took to Twitter to reassure concerned fans who suspected the presence of loot boxes or microtransactions. As Image & Form says below, "it's not that kind of game". We can hear the collective "hoorah" from you lovely readers already. "Probably not, we never do. That’s for practical reasons – we typically have to work on a game right up to the very last minutes before it HAS to be approved by Nintendo, and the lead times for physical production is always way, way longer than that. But we love physical editions just as much as the next guy. We’re likely to publish that at some point." It’s a very good question, and the very good answer is that Quest won’t come to 3DS, unfortunately. We brought SW Dig 2 – and all the others before that, of course – to Nintendo 3DS. We were taken aback by how “well” the Switch had replaced the 3DS in terms of digital sales. It’s safe to say that although there are many 3DS owners, the ones that were tech-savvy enough to buy games from the eShop were also tech-savvy enough to switch to, well, Nintendo Switch. I track our sales meticulously, and you wouldn’t believe me if I told you by how manytimes the Switch versions of our games outsell the 3DS versions. 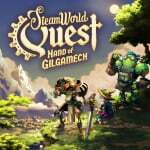 What did you think of SteamWorld Quest's announcement yesterday? Are you looking forward to this one? Share your thoughts with us below. Makes sense, the 3DS is on its way out. If this helps it release sooner on other consoles, it’s fine with me. Well, if any developer could get me hooked on a "card-based RPG" it's one like I&F. I actually had no idea Steamworld Dig 2 came out on the 3DS, and I even bought the game both digitally and later physically for the Nintendo Switch. That really does go to show that the 3DS's eShop is no longer the way for aspiring developers to go. I'm also grateful to see that Image & Form won't be monetising their card based game, considering how easy it is for the genre, and tempting to turn a one-time sale into a continuous revenue stream. Its sad the 3DS isn't getting any love right now, but at least there are no microtransactions. Keep that to free switch games please! Have you played Steamworld Tower Defense on DSiWare? Great, the one SteamWorld game I'm really interested in playing, and it's not coming to the 3DS (the only system I own)! This guy is a bubble of fresh air in the industry (like some other indie developers) and is nice to see them grow. I recommend to watch a interview of him with supermetaldave64 from maybe 2 years ago. Understandable. It's nice to see a developer basically confirm that the majority of 3ds owners who played indies have moved on to the Switch. Many other developers have seemed to catch on to that fact. @JamesJose7 I'm not sure but I bet they would make it fun! I love the world they've created with these games and the graphical style is absolutely gorgeous, it's a shame that this type of game just doesn't appeal to me in the slightest. Maybe the next game will be something along the lines of Super Steamworld Bros. Ultimate or Steamworld Dead Redemption! I suppose I'll have to play Steamworld Dig 2 for now to get that Steamworld fix. @RupeeClock Actually yes, I own that as well. While it was a nice start it's not a must own game. It seems very Slay the Spire-esque, but way better. I couldn't get into that game since the visuals were really.....poor to me (Slay the Spire I mean). But this though! I'll probably save up for it and download it day one. I started up SD1 again just recently and was so pleased to hear this news. These guys make games I really enjoy and I'm happy to support them. I gotta say it's refreshing to see a developer that's blunt and honest about these kinds of questions. Too many developers get asked basic questions like "will this be on 3DS?" and say stuff like "we're always looking at potential opportunities for future projects" instead of yes or no. Indies doing what the giant industry companies like EA, Bethesda, etc... Don't. By not adding microtransactions to games you pay for up front. I'm more excited to see what developers like them, yacht club, and chucklefish have coming. I commend them for having served the 3DS for this long. And I completely get their digital first approach. Its just the safer and more economic approach for a mid size publisher. And it benefits a physical release that the game has been played by end users, and patched accordingly. After World of Light, now this... what's with all these card games? @RitingFool Might be a good time to consider upgrading to the Nintendo Switch (if your finances call for it, of course). I honestly never play my 3DS anymore. That's not to say it's not a good system. In fact, I'd say it's the best system I've ever played. I am hoping that one day, Nintendo will consider bringing some of the handheld features (AR, pinging other Switch users out in the wild, chat, etc.) over to the Nintendo Switch family and make it a superb handheld as well as a great home system. On topic, this game looks very interesting to me, even if I'm not a fan of the genre overall. The fact that they aren't doing microtransactions is definitely a plus. Positives all round (apart from the understandable lack of 3DS support). A developer I’m very happy to support. But but... 3ds I still love you! These developers need our support. They are so good! also, i see they like Batman: The Anime Series. great show indeed. It's a shame that they have to confirm that the game won't have any MTX or lootboxes. This is why I glad Indies like this exist, just one too many "AAA" gaming companies(mainly Western) that are slimy as heck when it comes to that kinda stuff. 3ds is that dude's fav ever portable, so I'm sure that was a hard decision for him. In a Retronauts interview awhile back he still preferred it to Switch due to some ergonomic stuff. Excited for this - first foray into a card time. It's sad we live in an era where developers have to announce they won't have loot boxes and micro transactions in their games. Am I the only one who finds it weird and out of place that the world is a medieval one, instead of the post apocalyptic one the Steamworld world is supposed to be? I’m wary of card based games and it wasn’t a nice surprise to discover that this game is one of those. That turn it from a “buy instantly whatever Steamworld game comes” to “I’ll need to wait to watch gameplay and read reviews before deciding”, which is quite disappointing. But I’ll give them the benefit of the doubt and be open minded. I quite like that they take risks and they're expanding outside of just Steamworld Dig. Steamworld Heist was a lot of fun, and I haven't really played a strong card-based RPG since Baten Kaitos. Definitely looking forward to this one. Ok, so all of my moneys will be gone. Ok.
@maruse From the man himself: "...a medieval setting? How is that possible? Even the robots know there were no robots in those times. But we’ve got it worked out." I don't think the 3DS was ever a great platform for indie software despite its large install base. Obviously, there were exceptions (Shovel Knight and Steamworld Dig 1 were among them), but the Switch absolutely blows the 3DS out of the water when it comes to the commercial viability and success of indie content. Don't even know why they're going to bother with PS4 or Xbox. Just concentrate all your efforts into the switch version, it will outsell the others 5 to 1 anyway. Any money you lose out on in sales will be saved in development costs surely. @KryptoniteKrunch I liked how in the hidden Cyberpunk FAQ there was a lootbox question and CDPR answered "Microtransactions in a single player RPG? Are you insane?"